SANAA, Yemen (AP) — Troops from a U.S.-backed, Saudi-led coalition pounded Houthi rebel positions in Yemen's Hodeida with airstrikes and a ground assault on Wednesday and now control a major road leading into the city, military officials and witnesses on both sides of the front line said. An Emirati-trained force known as the Giants, backed by Apache attack helicopters, secured an urban area along 50th Street, which leads to the city's key Red Sea port facilities some 5 kilometers (3 miles) away, they added. Speaking on condition of anonymity for fear of reprisals or lack of authorization to brief journalists, they said that the Iran-backed Shiite rebels had been firing mainly from elevated and rooftop sniper positions, and have now resorted to burning tires to obscure the gunships' view. Most civilians have fled the area, they said. The Saudi-led coalition, which seeks to restore to power the internationally recognized Yemeni government, has been at war with the Houthis since March 2015. The stalemated conflict has generated the world's worst humanitarian crisis. 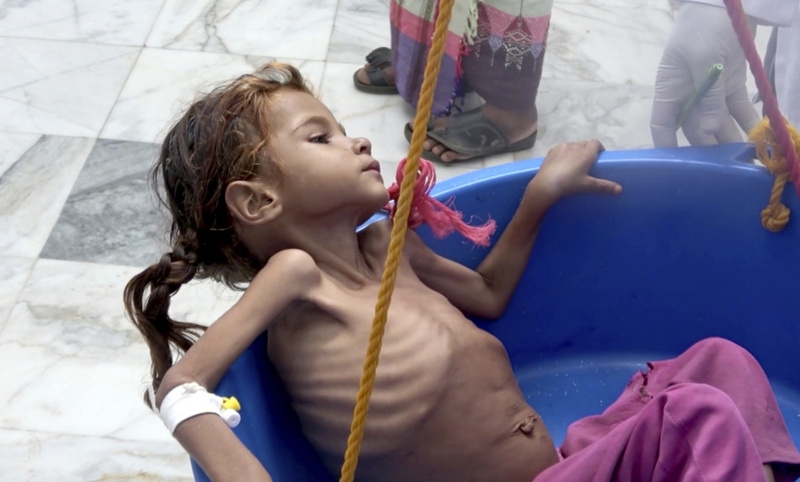 The head of the U.N.'s food and agriculture agency and other groups say the conflict has pushed Yemen to the brink of famine, underlining how the international community is failing to end hunger. "We are watching before our eyes an unprecedented human tragedy," Food and Agriculture Organization chief Jose Graziano da Silva told a high-level briefing on food insecurity at the U.N. in New York. In a statement, rebel leader Abdul-Malek al-Houthi described the U.S. cease-fire call as hypocritical, given that fresh fighting erupted almost immediately after it was delivered. The rebels, who brandish "Death to America and Israel" slogans similar to that of the Iranian leadership, accuse the coalition of being stooges of masters in Washington and Israel.